We're excited to announce the global release of a new extension, exclusively on Bing Ads — Action Extensions. This extension allows you to highlight a clear call-to-action on your text ads to entice customers to immediately click and drive them to your website. Advertisers who participated in the beta have seen an average click-through-rate (CTR) increase of 20% when they served Action Extensions in their ads. 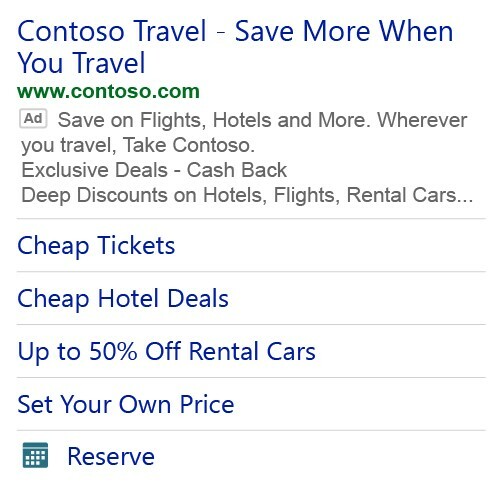 Action Extensions are available in all Bing Ads markets on both PC and mobile devices. 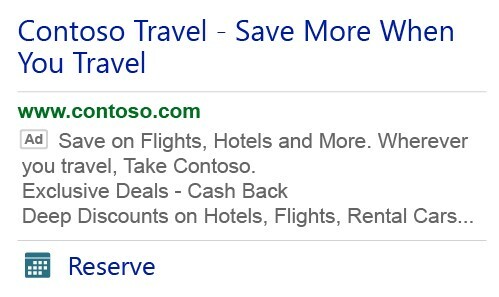 Advertisers across many verticals can leverage up to 70 pre-defined Action Extensions in all Bing Ads supported languages (English, German, French, Spanish, Italian, Portuguese (Brazil), Dutch, Swedish, Traditional Chinese, Danish, Finnish, and Norwegian). Like sitelinks, clicks on Action Extensions will be charged the same cost-per-click (CPC) as clicks on the ad headline. You can create Action Extensions via Bing Ads online, using the bulk account management tool, through the Bing Ads campaign management service API, or the bulk API. For additional information on Action Extensions, check out our help page. For any questions or feedback regarding Action Extensions, we encourage you to reach out to your Bing Ads account manager or contact Support. You can also ping us on Twitter, suggest a feature on the Bing Ads Feature Suggestion Forum, or send us an email with your thoughts to bingads-feedback@microsoft.com.